I done very little re-sawing beyond rib stock so I come to the hive with hat in hand. This is a piece of big leaf maple which I was fortunate to purchase from one of our number. What I am trying to figure out is how to get the most/best (most bestest?) backs out of the piece. I have drawn a sawing scheme as a starting point, but would appreciate any recommendations folks might like to offer. Now that I look at the picture more closely -- funny how a pic can change one's perspective --, I think I need to redraw the lines, moving them like the hands of a clock toward the right so the grain lines are more perpendicular to the cut lines. I should still get the same number of backs out of it, though. No cup needed. Step 1: Build a cage just large enough to fit the rabbit comfortably with a little room to roam. Make sure the floor is made from a strong screen. Step 2: Place a pan under the cage a little bigger than the dimensions of the cage. Step 3: Be sure the rabbit has plenty of water. Step 4: Play recordings of Steve Martin's acts for the rabbit. Step 5: Harvest the pee. Step 6: Repeat Steps 3-5. Not sure the grass is ever greener on the other side. It's actually brown most of the year here in TX. And that's not the only thing with which one could be dissatisfied hereabouts. I think when you start thinking about retirement and where to settle for that last stretch of your time on this mortal coil, you get a good perspective on the whole greener grass thing. None of which is to say, of course, that all places are equally problematic. Alaska? Mississippi? (It's a sad commentary that TX considers itself successful when it comes out ranked just above Mississippi on some measure.) Maybe KS is right up there. Or down there. Don't know. Never lived there. Strad (and other) models database? 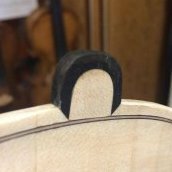 In observance of Addie's passing, Jeff agreed to pin this thread in which Addie shared his talent for creating templates of the forms of Stradivari along with other things. If anyone did not follow Addie's posts, this is a good place to begin to get to know his substantial contributions to our community. Or a tribute to speed? No stylistic niceties to observe in the carving/scraping process. If you are not familiar with Addie or his contributions here, search no further than the library of forma and other outlines that he created and made accessible to the community here and beyond. I regret I never met him and thanked him personally. I'd also be interested in knowing which of these tool designs are standard in the trade today. I do not get a cut (no pun intended) of Ernie's gains, I just want to attest to what a pleasure it is to buy from him. I recently purchased some tools for an apprentice and Ernie -- no surprise to anyone who has gotten to know him here -- is always responsive to questions and accurate in his descriptions of what he is selling. Plainly put, Ernie is a mensch. Any Violins or Cellos to see in Hong Kong? Very impressive, Jerry. In every respect. But use your external search engine because it will yield more comprehensive results than the MN search function.